There are only two purchasing options for buying stock images – a stock photo subscription and image credits (packs). Some agencies only offer one or the other, but some give you the option to buy either image packs or a subscription for downloading a nominal amount. So why would someone want to buy a photo subscription, you might ask? To save money per image, and to buy more images for a better price. Read more about Stock Photo Subscription vs. Credit Based Stock Agencies here. So, What are credits? Read more here. The best stock subscription is the one that allows you to download the most for less, and the image credit pack that saves you money is also the best route to buy. Subscriptions can be purchased by the day, week, month, or most commonly annually, and are defined by the number of photos a customer can buy. Some photo subscription sites further define their subscriptions by photo size or resolution. Subscriptions are best for designers or companies that buy multiple images per day or week while image packs are more suited for buyers who only have a small demand for royalty free stock photos. A subscription example would be our Stock Photo Secrets annual 99club subscription, that gives you 200 XXL images for $99 (only $0.49 an image), or our Low Volume subscription that gives you 600 XXL image for $199 (only $0.33 an image). NO additional fees! NO additional fees! Basically, if you’re a small-business owner or designer that needs hundreds of images per year for your business then photo subscriptions make the most sense. Find out The Top 7 cheapest stock photo subscriptions here. So maybe you need plenty of stock images but you’re unsure whether or not a stock subscription or credits will be the best decision for your budget. At a small business, budgeting correctly is one of the most important factors when making a business decision like buying stock photography. One major thing you must know is that often an image credit limits the size of the photo you can download. For instance, an image from Fotolia (read our Fotolia Review here) has a different credit cost with an x-small image costing on average 1 credits, and image prices can vary depending on the photographer. Some professional photographers cost more per image than amateurs on Fotolia. But for most stock photo subscriptions like our 99club and Low Volume plans, you can download any image in any size in the XXL size, which lets you confidently print at A3 size at 300dpi or 6’ x 6‘ at 72dpi. 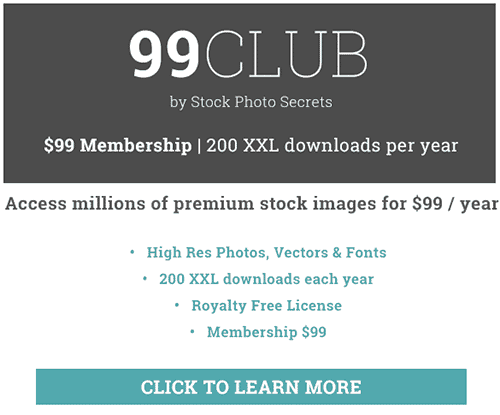 The Stock Photo Secrets’ 99club is a low-cost subscription that gives you access to 200 XXL image downloads per year for $99, but if you happen to download more than 200 you can buy additional image packs of 50 for $49; or 100 for $69. Subscription only $99 with NO additional fees! 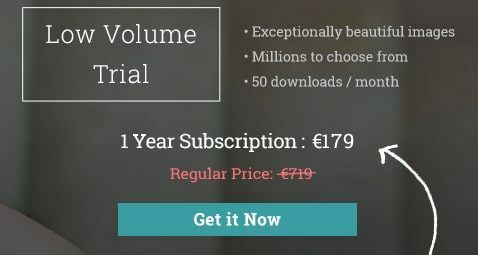 Our Low Volume subscription is one of the most affordable stock subscriptions for small- to mid-sized businesses with needs for hundreds of stock image download per year, which is 600 XXL images for $199. Only $0.33 per image! with NO additional fees! Subscription is only $199 with NO additional fees! While we have helped you better understand the different between image credits and photo subscriptions in plain English, there are also some things you must consider finding the right photo subscription for your small business. 1. Is the price right? Some subscriptions will cost you quite a bit in the end. The best way to figure out how much you will save is to figure out the amount each image will cost in your plan. For example, our 99club subscription will cost you $0.49 per image, and our Low Volume subscription will cost you $0.33 per image. How stock agencies process their payments for their subscriptions should be another concern when choosing the right subscription plan. Most companies offer up credit card payments from Visa, Mastercard, and other traditional credit companies. But if you’re international in a country where these credit cards aren’t necessarily common, PayPal will be what you’re looking for. Wonder Which Top 5 Stock Photo Agencies accept Paypal?, well click here to find out. Many companies today, and even Stock Photo Secrets prefer PayPal for payment of their plans. A good stock photo agency updates their image collection every month with thousands of new stock images for their clients. 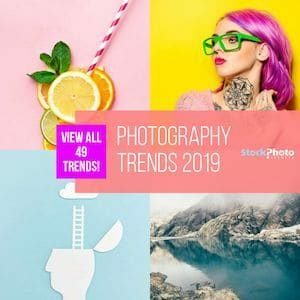 At Stock Photo Secrets, we add up to 80,000 new stock images to our collection every month and make them immediately available to download for our subscription holders so they can use them right away. With new stock images, you get the latest and greatest from our contributors. A standard image license is quite common for all stock photo agencies, and most, if not all, offer extended license options that are specifically for small businesses who need to use their images commercially. For example, an extended license would be needed for someone selling t-shirts with a stock photo on it. They could only do so with an extended license. With all Stock Photo Secrets subscription plans, you can add an extended license to each image starting at $30 per image. Multi-seat licenses are purchased separately and enable multiple users on one subscription. 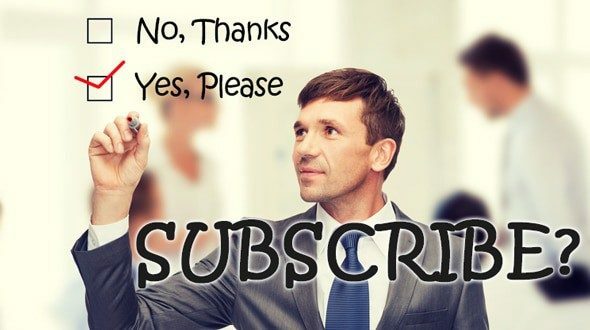 When you purchase a subscription the subscription can be used by one person in a company. Multi-seat licenses extend the subscription to additional users. Both of our subscription plans have limited availability and are filling up quickly because of their affordable pricing and what you truly get. Since both subscription plans are for only a limited time, I have put together the most pertinent information you’ll need to get started with either plan. Subscription is only $99 with NO additional fees! The best photo subscription is the one that saves you money, gives you access to premium stock images, and has the best support for their customers. While an image credit pack may be great for some businesses who barely need any stock images, a stock photography subscription is the best option for small businesses who have a real need for hundreds of stock images per year. At Stock Photo Secrets we know that stock image needs differ for different businesses, and this is exactly why we offer our 99club and Low Volume subscription plans to our customers. We know that 200 images per year might fit small businesses and graphic designers better and that 600 images will fit small- to mid-sized businesses that need hundreds of more images per year. The point is, a stock photo subscription is the best option for small businesses as compared to image credits, not only because they save you money, but they give you more stock images for less. By understanding the costs and limitations associated with image credits vs. subscriptions, you can use the information we’ve given above to make the best choice for you and your business needs. Click here to join 99club now or Sign up today for our Low Volume subscription and get 600 XXL images for $199, without any restrictions! 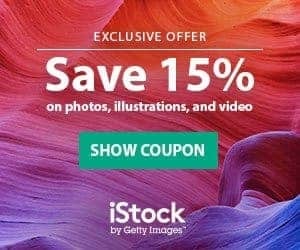 Discover the Best Alternative to Thinkstock – Unbeatable Offer!